Watching the Trump administration dissolve in real time on social media today was like watching that creepy snowman built by your psycho neighbor across the street lean and collapse with the first thaw. First, we were treated to the news this morning of the indictment and arrest of Roger Stone in Fort Lauderdale today. The self-described Republican dirty trickster "was charged with seven criminal counts including obstruction of an official proceeding, witness tampering and making false statements." Regarding witness tampering, Stone had threatened radio personality Randy Credico, the man who was identified by Mueller's team to be the conduit between Stone and Wikileaks. To show you what a guttersnipe of a thug he is, Stone had threatened to steal Credico's service dog, threatened to kill it then threatened his own life in an email in which he'd written, "prepare to die." Months earlier, when Credico was scheduled to testify before the House Intelligence Committee, then under GOP control. Stone had already testified before it in September 2017 and of course told them a pack of lies. As Credico's own testimony date was drawing near, Stone told him to "do a Frank Pentangeli", a reference to the mobster in Godfather II who changes his testimony before a Congressional committee to shield the Corleone crime family. Afterward, the Corleones' consigliere visits Pentangeli and gently suggests he commit suicide, which he then does. Yes, Roger Stone is taking is his cues from mob movies, which only goes to show what kind of thugs with whom Donald Trump chooses to associate himself. We know Trump's mobbed up. We don't have to look beyond the upper stories of Trump Tower to know that. Yet, if we're to believe the right wing spin (such as Sarah Sanders with that now permanent pleading, "please don't whip me, master, I'll do much better next time!" look on her face, who pathetically kept clinging to the old talking point, "Yeah, but this latest arrest and indictment still doesn't have anything to do with the president!" Patience, my dear child, the night is still young. 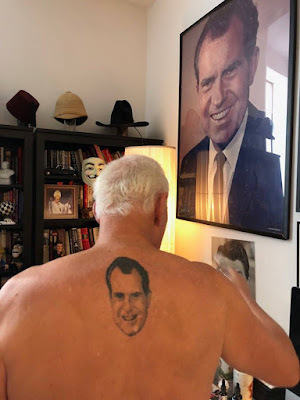 And the buzz on the Beltway is that Steve Bannon will soon push Roger Stone off the front page because he's deeply suspected to be the one who directed Stone (on Trump's direction) to contact Wikileaks about them publishing the Clinton emails stolen by the Russians. And if it's proven that Trump directed Bannon to direct Stone to direct Wikileaks to torpedo the Clinton campaign, then that's just two degrees of separation and that'll be the end of Trump's "presidency."